Yesterday was one of 'those days' for me. Sometimes I get really tired of having to 'sign in' to 'visit' my baby. I long for the day when my sweet Fletcher will be home and all I will have to do is go into another room to see him. I long for the day when he can talk and tell me what he's thinking. I long for the day when he can walk beside me and hold my hand. The longing is unbearable sometimes. Sometimes, the longing is what gives me hope. Unfortunately, yesterday was one of those days for Craig and me, but we talked ourselves through it. By the end of our conversation we were both very thankful that Fletcher had made it this far. We were both very thankful for the Children's Center where we have to 'sign in' to 'visit' our son. We were both very thankful to be Fletcher's parents, because what if he had different parents who abandoned him at the Center and never visited him? We're grateful for our circumstances and we know where to turn when we're having one of 'those days.' And we know that God's Word can always provide comfort. Today as I was searching for some comfort I found this scripture, 'A longing fulfilled is sweet to the soul' Proverbs 13:19 This made me think of the dream I had of Fletcher walking, that's sweet to my soul. I need only to turn to the Lord for comfort for He knows me better than I know myself. I guess every now and then one of 'those days' isn't so bad. What a sweet entry. I understand having one of "those days". Just remember...God chose you for Fletcher. Not someone else. You are such a great mom to him and such a blessing to so many of us. You touched my heart - more than you know. Love you! I LOVE what you wrote! You and Craig have such a wonderful relationship and you are both awesome and loving parents and I am thankful that God has brought you so close through all you have experienced. A friend of mine just sent me an e-mail in response to your good report for today (3-08-07) and this is what she wrote: "I'm so glad to hear the good news! Thank you Lord for keeping Fletcher strong and for giving him to a great mother. Lots of Love. Keep me posted on our little buddy!" Isn't that so awe inspiring and timely??? I enjoyed my time with you and had SO MUCH fun with Fletcher on Saturday - it was an incredible day and I can't stop thinking about him! I am SO blessed by our incredible boy! He is so sweet! He is FULL of LOVE! He kept blowing me kisses and more kisses the whole time I was there. And he kept cracking up at me, and even though I was trying to be funny, I really didn’t think I was being all that funny (and I knew he didn’t really feel that great). He has an outstanding personality (I know I may be biased…- but if anyone is just in his presence, you will see it too) – he just captures you with his sweetness! 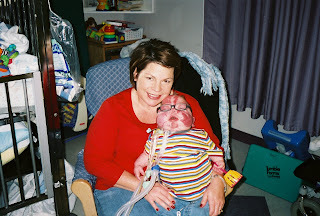 He can’t talk due to the trach (for now) – but it is in his eyes…the way they light up and watch you – I just can’t describe it...He is so kind and gentle when he touches your face and your hair...he doesn’t pull it or jab at it like most babies, he is just really gentle. I figure it is because he knows what pain is all about and he does not want to inflict any...He is very attentive and wants to enjoy every single moment he has with you...I think I can learn a whole lot from this courageous gift from God that we are blessed to know!! !